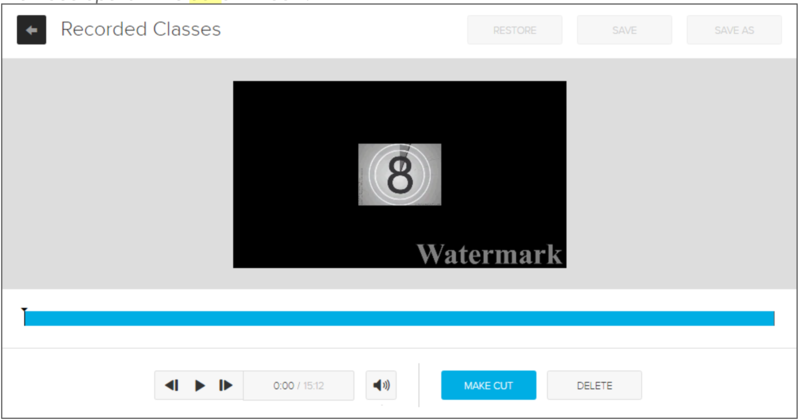 As an instructor, you can edit video directly your Library Page and clicking on it. Alternately, you can go to your Class List page and choose Edit video from the green play button dropdown. Then you are ready to edit your video. Select the Edit Video icon to edit the video in the upper right of your screen. The video editing screen appears. To delete a portion of video, place the black playhead marker at the beginning of the segment you want to cut and click MAKE CUT (see left side of image below). Click to place the black playhead marker again at the end of the section you want to cut and click MAKE CUT a second time. Select the area between the two cuts to select it. This area will change to a lighter color as shown. Choose DELETE to temporarily cut the video. Repeat this process until you have removed any video you want to remove. When you are done select APPLY EDITS. To revert segments (restore them) if you make a mistake, select the gray cut segment. Choose REVERT to restore the deleted portion of the recording. Once you are done editing, you can SAVE which will change the video if you have it published. Select SAVE AS to make a new copy.